In the previous blog post entitled “3 Most Important Steps to Start Asset Management”, one of the basic steps is “Getting your asset maintenance programs well-sorted-out”. Ross explained that the reason this is basic was based on their experience in New Zealand. He recalled that in their initial asset management analysis there was a big backlog of infrastructure renewal, for pipes mainly. This, of course, translated into more maintenance requirements until this backlog could be addressed. Often with maintenance expenses, there will be just one large budget line, and you won’t be able to keep track of the direction of your expenditures. You end up wondering where you spent most of your money. If you take a closer look at maintenance expenditure, like following the money trail, you can discover that you actually spend an awful lot of money in asset maintenance and operations, and many times not as effectively as you would like. Are there some things we can do smarter? Can we optimize some assets for preventive maintenance? As an example, Ross shared his contract with quite a large utility in New Zealand a few years ago. The utility had 120 wastewater pump stations. At that time they were inspecting them every day. Ross saw this as a lot of inspections and wondered why they’re inspecting the pump stations every day. Ross learned that the whole reason the daily inspections were done was that that’s what they were used to do 20 years ago. However, Ross found out that that was before they put the SCADA (or telemetry) system in and they now had a really good remote monitoring and alarm system in place. “Well, do you really think you need to be doing daily inspections?” Ross asked them. Their answer was no. Thus, the utility personnel decided to do weekly inspections to check for a build-up of fats, making sure there were no blockages in the pumps, cleaning and washing down the well and other tasks. Ross added that there was still a really good reason for weekly inspection, just to make sure they stayed on top of problems and preventive maintenance. He thought they probably could have gone fortnightly or even monthly inspections but these little steps building confidence in a changed maintenance regime (and the ability to manage perceived risks) are a good start. What happened after the change in inspection schedules was the guys who were doing the daily inspections were redeployed to do some other things that hadn’t been happening, but that they needed to do. They were just being far more effective in terms of that part of their maintenance program. 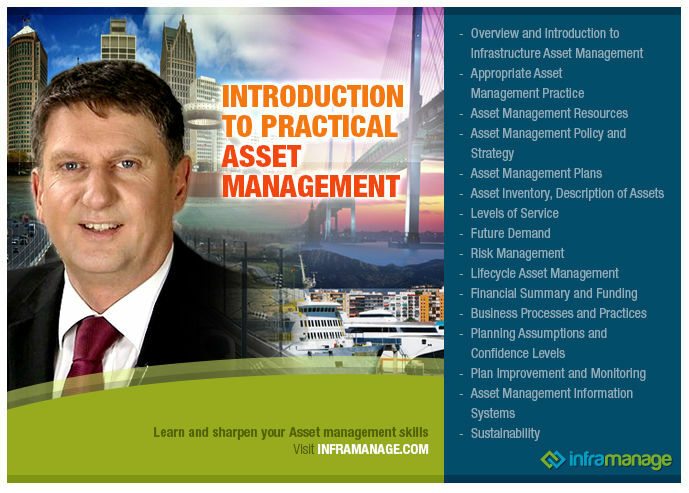 Ross emphasized that if you do the basics right, then you’ll take care of a good amount of the gains you can make from infrastructure asset management. A well developed and understood asset scheduled or preventative maintenance program is a core component to good infrastructure asset management practice. In analyzing scheduled or preventative maintenance programs, an understanding of trends, patterns, risks, and issues can be gained, and then programs adjusted as required to optimize expenditure and to better manage the asset.